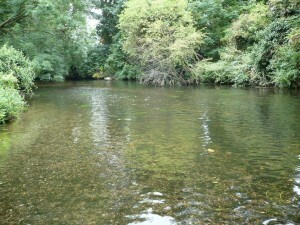 There are probably more places to go fly fishing in Greater London than you think. The reservoirs at Walthamstow, lakes in Halliford mere and the lake in Syon Park are stocked with brown and rainbow trout, while rivers and canals contain sea trout, trout, pike, perch, chub, roach, dace, bream, carp and other species. Better still, you can catch them all on a fly! The reservoirs at Walthamstow in the Lea Valley are owned by Thames Water, and are operated as a fishery complex and nature reserve within easy reach of Central London. The entrance to the fishery is on the Forest Road opposite the Ferry Boat Inn, about halfway between Tottenham Hale and Blackhorse Road tube stations. Situated in Zone 3, the fishery is easy to reach on public transport. Via London Underground: the Victoria Line goes to both Blackhorse Road and Tottenham Hale. The entrance is 10 minutes’ walk from either station. By bus, the 123 and 230 routes stop outside the fishery, and the W4 stops 100 yards from the entrance. Syon Park fishery is a small stillwater with “Catch & Kill” policy, situated in the grounds of Syon House, just across the River Thames from Kew Gardens. The 6 acre lake is regularly stocked with adult brown and rainbow trout from Albury averaging 2lb 8oz up to more than 10lb. High noise pollution from City sound and flying over every two minutes planes landing in Heathrow doesn`t give you opportunity to relax. Sometimes overcrowded at weekends. It wouldn`t be my choise. Two very cosy lakes stocked with Rainbow and Brown trout. Situated 1.5 miles from Epping tube just outside M-25 in the village of Thornwood. London’s canals, rivers and even chalkstreams are relatively accessible for fly fishing, yet they are often unknown and ignored, and it is sometimes difficult to know where to start. Contact me or visit the Wandle Piscators’ website for more information.